November 23, 2012 10:04 pm. (Reuters) – Egyptian President Mohamed Mursi will meet senior judges on Monday to try to ease a crisis over his seizure of new powers which has set off violent protests reminiscent of last year’s revolution which brought him to power. “…Egyptian President Mohammed Mursi says the decree giving him sweeping new powers is temporary and not intended to concentrate power in his hands. 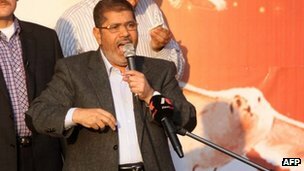 A statement from his office said Mr Mursi was committed to finding “common ground” with other parties. He will meet senior judges on Monday.